Envirowaste - Packaging Council of New Zealand Inc.
Food and packaging waste is an unavoidable by-product at all points of the supply chain, from the farm to the factory to the muesli bar in your school kid’s lunchbox. When food and packaging end up as waste, valuable resources are lost. But signs in New Zealand’s food industry are pointing the right way, as food manufacturers introduce sustainability programmes to meet the challenges of population growth, competition and consumer demand for new products. One initiative finding favour with food manufacturers is diverting food and packaging waste from landfill. Consumers are on board too, with a host of market research reporting more interest in food products that are produced sustainably. From an age when brand integrity considerations fixated on the destruction of non-compliant ingredients and products, food manufacturers today have access to a new generation of green technology and services to pursue a bolder vision for waste recovery and reuse that works for both the environment and the bottom line. The shift makes good business sense, creating valuable points of difference for consumer products on supermarket shelves, and inviting a re-examination of processes that can result in reducing factory inefficiencies and the amount of food manufacturing waste disposed of at landfill. Even so, industry’s embrace of practices to extract value from waste is still evolving, as food manufacturers balance adopting new solutions, that are not necessarily costlier than waste management practices followed today, into their already complex businesses. Diverting edible or salvageable food to food banks and food rescue programmes should be at the top of every food manufacturer’s list. When that isn’t possible, food waste can be converted to animal feed. More recently, composting, vermiculture (worm farming) and energy recovery have found favour with companies looking to unlock further value from their waste. So what’s the catch? Like food manufacturing itself, waste recovery and reuse is a complex business blending science, technology, logistical support and a network of industry relationships. Food manufacturers accept that they can’t do it alone and look to experts like EnviroWaste to bridge the gap between waste creation and recovery solutions. 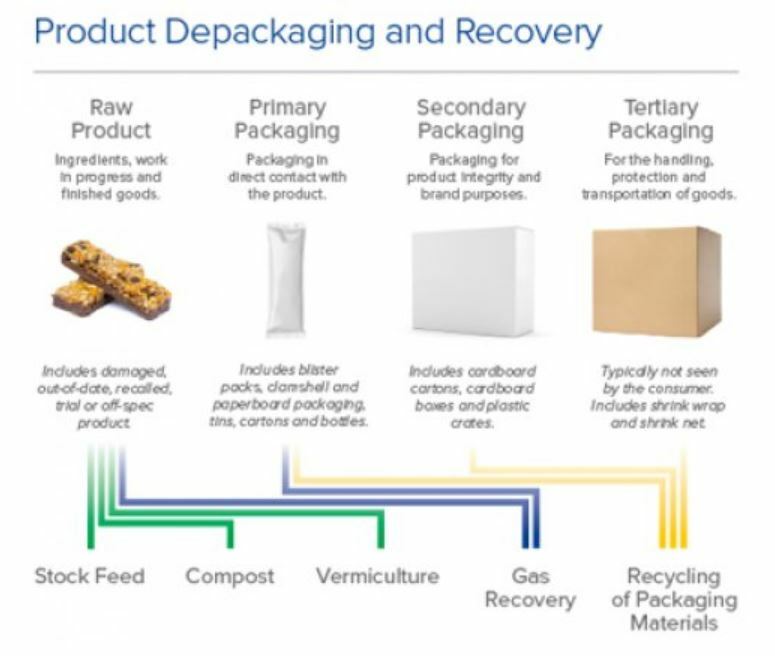 De-packaging processes are particularly complex. Specialist equipment manages a variety of dry and wet food types and tasks, such as removing wrappers from cheese, separating liquids from plastic bottles, and cooking oil from drums. And while packaging accounts for just 4% of the lifecycle waste of a food product, it must be removed before food can be recovered, and washed and prepared for recycling. Even manufactured food waste deemed unfit for human consumption requires specialist infrastructure and expertise to preserve its integrity for reuse. For example, animal food ingredients must satisfy industry standards for cleanliness and remain free of contaminants. Interestingly, standards for handling food waste can be as stringent as those governing food manufacture. EnviroWaste has made significant investments in recovery processes designed to minimise potentially re-useable food and packaging waste going to landfill, in the process diverting recovered materials to alternative uses. Our secure de-packaging facility in Auckland, together with a large-scale composting operation in Waikato, address all points of product and packaging recovery, effectively closing the loop on waste creation and recovery. Today, raw food products and ingredients rejected on the basis of damage, out of specification, recall and past use-by date, provide the necessary ingredients for EnviroWaste’s stock-feed, composting and vermiculture operations. Similarly, primary packaging (e.g. blister packs, tins, cartons and bottles in direct contact with food), secondary packaging (e.g. cartons and plastic crates) and tertiary packaging (e.g. shrink wrap protecting transported goods) are recycled where possible, with residual components providing the raw material for our gas-to-energy business that generates electricity for the national grid. Irrespective of advances in waste recovery, everyone should dwell on the adage that prevention is better than the cure – that generating less waste in the first place is better than managing it. Still, when imperfection is a permanent characteristic of the creation process, and as consumers demand new products, waste is here to stay. But one thing is clear: manufacturers who adopt solutions for their waste will achieve better results for the environment – and their business bottom line.